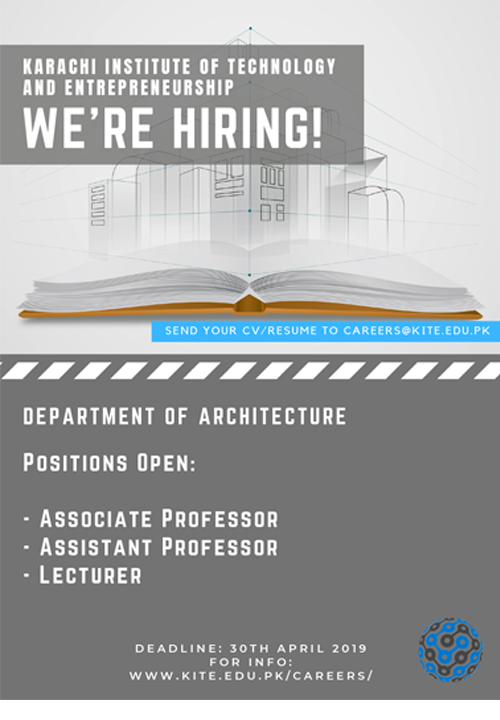 School of Art and Architecture (B.Arch) = Here at KITE, we offer an international standard 5 year undergraduate Bachelors degree in Architecture taught by highly qualified practicing architects, academics and industry professionals. 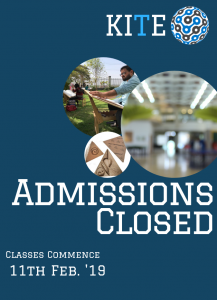 Our fulltime and adjunct faculty are graduates of the Indus Valley School of Art and Architecture, the National College of Arts and other renowned HEC recognized universities as well as international universities. Our board of studies and advisors are from famous Architecture schools at the MIT, Yale and other influential academic institutions. We offer a mix of skills, theory, liberal arts, design and both traditional and contemporary studies. Our students will be exposed to renewable materials as well as modern techniques for sustainable design. Our inverted classroom and project based learning style of studies will ensure individualized interests and personalized education with small student to faculty class ratio. 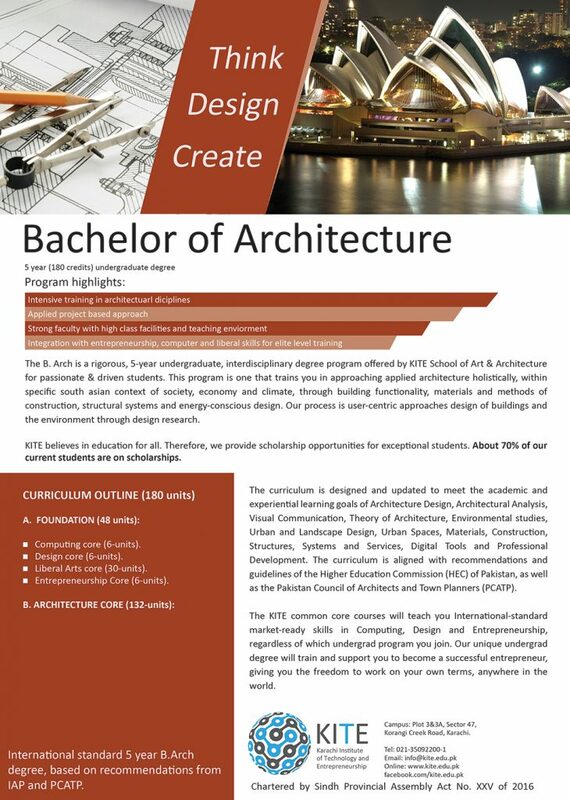 Our B.Arch foundation year is the same as the B.Des foundation year which means if you want, you can switch to the B.Des degree after completing your foundation year, if you feel that B.Arch is not the degree for your future career. From ancient history to contemporary practice in Pakistan, KITE B.Arch offers you more than just an architecture degree, we offer our standard T-shaped model of Design, Computing and Entrepreneurship courses to make you a well rounded entrepreneur. Regardless of your degree major, you will have the skills needed to start your own company or startup. 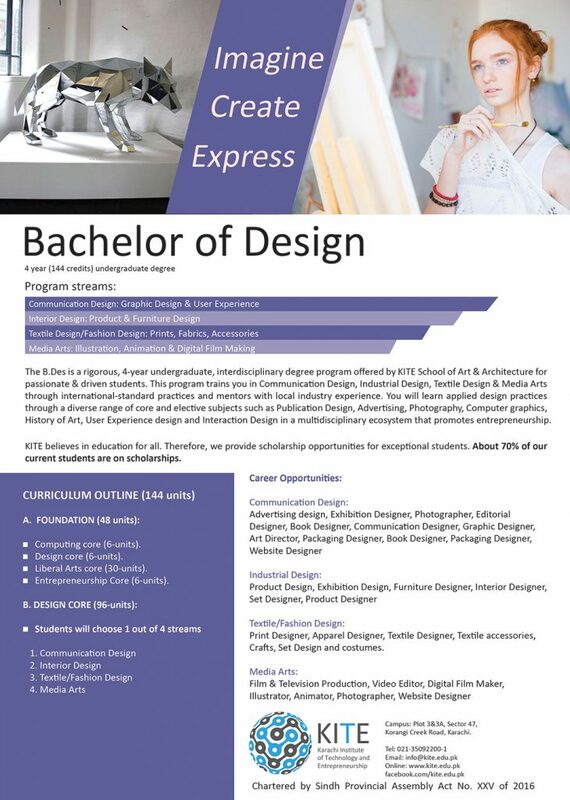 After completing your B.Arch degree, not only are you qualified to practice being an Architect for construction anywhere in the world, but you could also work in Interior Design, Furniture Design, Event Management, Set Design, Home Décor and all careers related to construction of buildings, offices, commercial and residential units. Leave your mark on the world by becoming and Architect here at KITE. School of Art and Architecture (B.Des) = The 4 year undergraduate Bachelors in Design degree offers unlimited flexibility, career options as well as academic freedom to choose your own future. Our students will be exposed to renewable materials as well as modern techniques for sustainable design. Our inverted classroom and project based learning style of studies will ensure individualized interests and personalized education with small student to faculty class ratio. Our B.Des foundation year is the same as the B.Arch foundation year which means if you want, you can switch to the B.Arch degree in second year after completing your foundation year, if you feel that B.Des is not the degree for your future career. Whether you want to do freelance work, start your own company with classmates, become an independent entrepreneur or join a multinational design organization, the B.Des degree offers you enough freedom to choose from the many skills you will be taught and specialize in your areas of interest. Our B.Des degree offers many MAJOR subjects as well as MINOR electives. Our Communication Design Major offers the best combination of applied Graphic Design in context of advertising, brand and corporate communications, branding and campaign design solutions. We tackle both analog printed materials such as books and posters and stationary items as well as digital new media artifacts such as mobile apps and websites. Our Industrial Design Major allows you to design and prototype physical solutions to everyday problems such as furniture, tools, utensils, safety equipment, wearables, industrial user interfaces, controls, ergonomic products and human computer interaction devices. Our Interior Design major is all about beautifying the inner space of a building or living and working area as well as the daily decorations and objects needed to change the space based on your living needs. Our Textile Design major explores printed and digital design, fabrics, clothes, apparel, home fabrics, fashion and accessories. We offer complementing MINOR subjects such as Media Arts, Animation, Photography, Digital Film Making and Illustration to further give you the tools and skills needed to tackle any king of creative project. 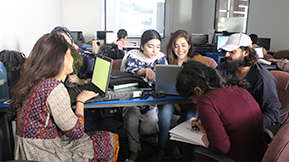 With world class faculty and international standard syllabus and tools, the KITE B.Des degree offers more than any other creative field in Pakistan. KITE B.Des offers you more than just an design degree, we offer our standard T-shaped model of Design, Computing and Entrepreneurship courses to make you a well rounded entrepreneur. Regardless of your degree major, you will have the skills needed to start your own company or startup. After completing your B.Des degree, not only are you qualified to practice being a designer for print or digital medium anywhere in the world, but you could also work in Graphic Design, Advertising Industry, Publication Design, Non Profit organizations, Public Relations and Communications, Game and Animation companies, Film Studies, Photography Studios or just do freelance work.